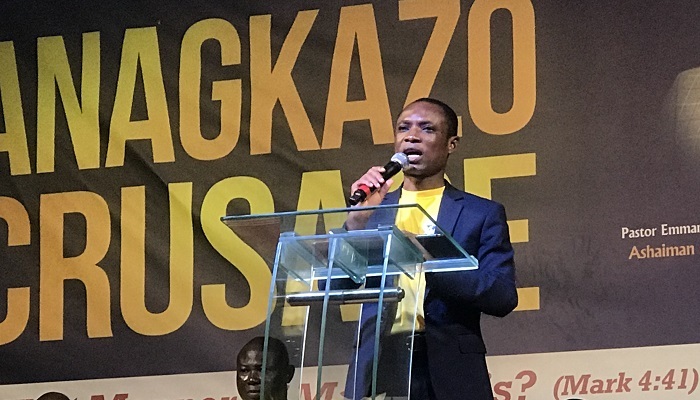 Abossey Okai Worship Centre in the Kaneshie Area of The Church of Pentecost has held a mammoth four-day crusade dubbed “Anagkazo Crusade”, to preach the gospel of Jesus and lead many to Christ. The event, which was under the theme, “What Manner Of Man Is This?” based on Mark 4:41, was held from Wednesday, September 26 to Saturday, September 29, 2018, at the Nateco School Park and climaxed on Sunday, September 30, 2018, at the church auditorium. Speaking on the theme of the event on the first day, the Resident Minister, Pastor Daniel Okyei Boakye stated that “Jesus Christ is the only accredited and approved personality” who brings salvation and eternal life to sinners. He also revealed that Jesus Christ has authority over creation and therefore is not an ordinary “man”. The District Minister of Ashiaman Official Town, Pastor Emmanuel K. Antwi who spoke on the second day, stated that Jesus had to pass through Samaria according to John 4:4 because He needed to bring hope to the hopeless. The sermon was interspersed with his personal encounter with Jesus and how he received salvation and eternal life. On the third day, Pastor Joseph Asamoah Boakye (Mataheko District Minister) revealed that although a lot of men have lived and continue to live on earth, none of them has the power to forgive sins and bring eternal life to those who believe in Him except Jesus. According to him, if the wind and storms heeded and obeyed the voice of Jesus, then human beings have no excuse to disobey Jesus when He calls out to them. Pastor Daniel Okyei Boakye, who also doubles as the Kaneshie Area Youth Pastor, also testified of how God healed him of a chronic and severe asthmatic condition in his early years. According to him, this was after he came to understand that Jesus had the power to heal all manner of diseases. Activities of the fourth day began with the “Anagkazo Jesus March” at midday. The evening session was characterised by testimonies, worship and praises. Elder Peasah Alemale of Kwashieman District also spoke on the theme of the event (“What Manner Of Man Is This?”) with a clarion call on all to accept the Jesus as Lord and Saviour. The crusade was climaxed on Sunday at the Abossey Okai Worship Centre church auditorium with an inspirational sermon from Pastor Emmanuel K. Antwi on the topic, “God Will Never Forget You”. The service recorded an attendance of 889 people. The Anagkazo Crusade was blessed with song ministrations from Elder Laweh, Braa Kwaku, Deaconess Dorothy Koomson, District Mass choir and Voice of Pentecost. To the glory of God, 80 souls were won during the four-day event.